Newcastle has a reputation as a party city but it is so much more than that. It’s a wonderful place to shop, there are several art galleries and places of culture, and there are a lot of things to do besides party the night away – although you can do that too! If you’re planning a long weekend break in Newcastle, here’s what you can do over 4 days in the city. Pack your bags, it’s going to be a good one! 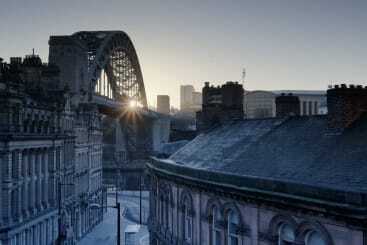 After your journey to Newcastle, there’s no doubt you want to freshen up for your first taste of the town. Check in at Roomzzz Newcastle City from 3pm, get settled in your room and get ready to go out for drinks and dinner. Roomzzz Newcastle is easily located so you can wander into town at your leisure. Whether you’re an early or late diner, Gusto – which serves up Mediterranean style food – never fails to impress. Located on the Quayside, Gusto has incredible views of the Tyne Bridge and is the perfect place for a relaxing meal out with friends or family. 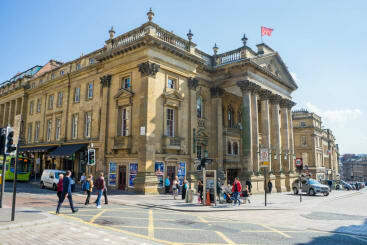 Newcastle has a surprising amount of art galleries which house famous modern and traditional art. Break up your day of wandering around Newcastle by popping into The Baltic Centre For Contemporary Art which is located in a former flour mill and now hosts several ever-changing exhibitions of contemporary visual art. The Biscuit Factory, which opened in 2002, shows off a selection of contemporary art, prints, jewellery and handcrafted art. If you like your art a bit more traditional, go to the Laing Art Gallery, which is Newcastle’s oldest gallery, and discover a permanent exhibition of North Eat Art alongside rotating exhibitions of historic and modern art. In between the art galleries, make sure your camera is handy to capture all those Instagrammable moments. From the Tyne Bridge in the sunshine to treat-yourself cupcakes at The Great British Cupcakery, there’s a photo op around every corner. Just walking the streets of Newcastle you’ll come across beautiful Georgian buildings which will look ace on your feed and there’s a great view of Grainger Street from the top of Grey’s Monument too. Okay, you don’t have to go “out out”, but if you want a good night or just a casual drink before bed, there are plenty of places in Newcastle that will suit groups of friends or family units. Tyne Bar at the beginning of the Quayside offers a great variety of beer which is perfect for a down to earth catch up. If you are doing Newcastle proper Geordie style, starting out at The Gate is the place to be. With several bars and restaurants including Tiger Tiger, Beyond Bar, Opera Piano Bar and Lounge, and Za Za Bazaar, the atmosphere is always good in here. End the night in Flares in Newcastle’s LGBT area, if you’re looking for a good place to dance in Newcastle. Friday and Saturday night attracts the locals so get ready to hear some Geordie slang if you’re here at a weekend! For something a little more laid back, the ever popular Brew Dog is the place to be. Play some board games, hang out with friends, and then take the short stroll back to Roomzzz Newcastle City when you’re tired. Take it easy today and have a wander around Newcastle’s shops for the day. Intu Eldon Square has some of the biggest high street names where you can shop until you drop. 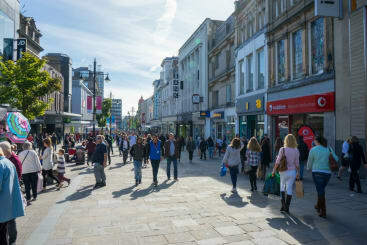 Located alongside Monument, Eldon Square has several exits including one that spills out onto Northumberland Street – Newcastle’s biggest shopping street – where you can continue your spending spree. You’ll find John Lewis, Apple, Topshop, and River Island all here! Grainger Town is the place to go for more boutique and individual shopping along with some exclusive shops such as Reiss, Kurt Geiger, and Vivienne Westwood. It’s on Grainger Street too where you’ll find Central Arcade – an ornately tiled shopping arcade housed under a glass roof. You’ll also find Grainger Market here, a place full of wonderful foods fresh from local sources in the North East of England, you’ll also be greeted by the lovely locals inside the market so if you do fancy a stroll through here, this is not to be missed. A quirky interior, fresh pasta and pizza, and salads, The Herb Garden is the perfect place for a pit stop to refuel in between the shops. If you’re here on a weekend though, you might want to pop in for brunch where you can get a breakfast platter to share. This giant plate of food includes avocado with fluffy eggs, potato hash, sausage, bacon, and lots of other delicious breakfast foods. For something more on the sweet side, try out their breakfast pizza with chocolate, hazelnut, banana, ricotta, honey, and vanilla ice cream. 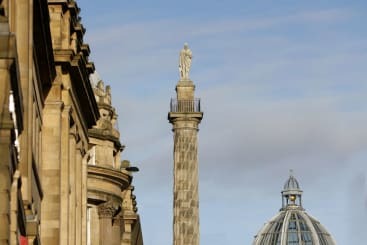 If you’ve got the energy, climb up Grey’s Monument, which was built in 1838, for amazing views over Newcastle and Grainger Town. It might be a bit of a slog but it’s worth it when you get up to the top! Both adults and kids will love this so if you’re a family on a long weekend in Newcastle, definitely give this a go! One of the perks of staying at Roomzzz Newcastle City is that each apartment in the aparthotel comes with its own kitchen. That means you can grab whatever food you want from the supermarket and have a chilled night in with your family, friends or loved ones. This option is also quite good if you’ve spent a little too much in the shops or are enjoying a city break on a budget! 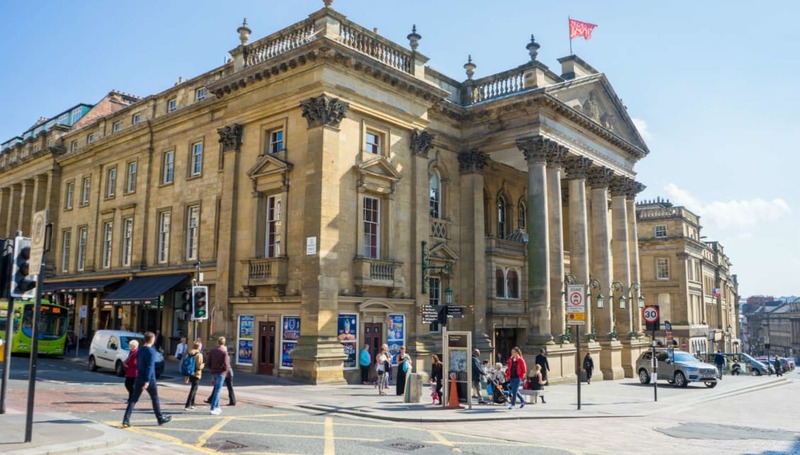 Newcastle is a huge supporter of the arts industry and that’s telling with its two great theatres – Northern Stage and the Theatre Royal. Both show excellent shows including Spirit Of The Dance and Evita. Book your tickets and get into Newcastle’s arts scene, you’ll leave wanting to come back for more! Just because you have to check out at 11 am, doesn’t mean you can’t make the most of another day for your weekend in Newcastle. Leave your bags behind at reception and go off exploring for the day! This might best be done at the beginning of your trip if you want to get your bearings but there’s always something to learn on a walking tour. In the summer – from June until September – take a City Highlights tour to learn more about Newcastle. It only costs £5 and your guide will tell you about the history and culture of this amazing city! If you’re in Newcastle on a Sunday, make sure you head down to Newcastle’s Quayside Market. Independent traders come down here every Sunday to sell handmade jewellery, food, photos, ceramic art, vinyl and much more. Street artists and buskers come down here too to make the atmosphere even more lively. What’s more, it’s by the river too so the scenery is stunning. For a truly cultural weekend in Newcastle, definitely try and fit this into your plans. There’s so much more to do in this city but we think 4 days will give you a good taste of what this city has to offer. From enjoying your apartment at Roomzzz Newcastle to exploring the city itself, Newcastle is a great place to come with family, friends, or loved ones and we hope you enjoy it as much as we do! Have you spent a long weekend in Newcastle before? Tell us your favourite spots! Don’t forget, if you visit any Roomzzz Aparthotel, use #Roomzzz on your social posts for the chance to win a free night at a Roomzzz Aparthotel location of your choice!